I am falling in love with the creative ways flowers are being suspended. Playful, elegant, and interesting, this simple trick has the ability to elevate any wedding design. I’m excited to see it becoming even more prevalent in events during the upcoming year! Below are some favorite inspirations and ideas on how you can incorporate them into your soirée! 1. Dramatic – This “On Cloud Nine” wedding inspiration featured on Ruffled shows how dramatic and creative flowers can be. 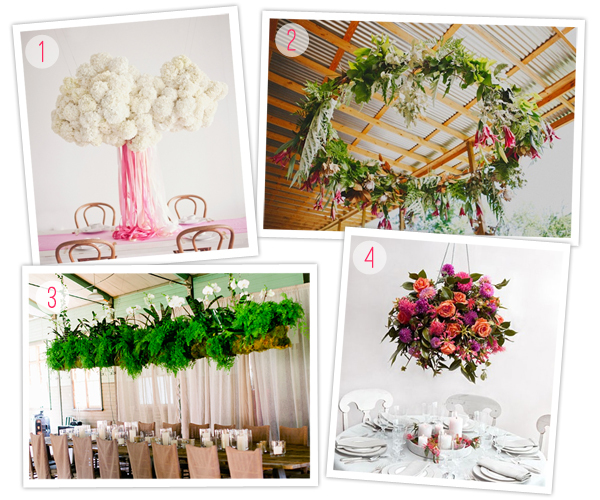 Arranging the white hydrangeas into a giant cloud formation and suspending them over the table is a unique way to follow the theme and let the flowers shine. This floral arrangement would be fabulous to display over a signature table, favors, cake, candy bar, etc. Don’t ever be afraid to take a chance and challenge flowers to show their creative side, the results can be breath-taking. 2. Whimsical – Arranging flowers into a large hanging wreath suspended sideways can be the perfect way to create a focal point at a reception or even the ceremony. 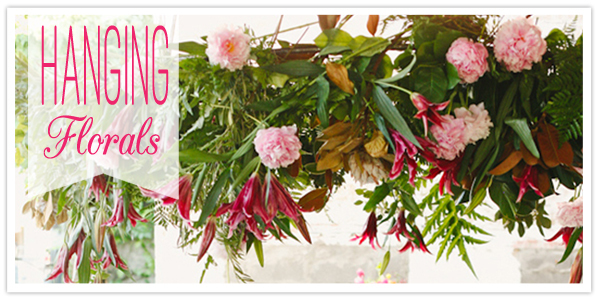 The greenery brings a natural aspect white the pops of pink from the lilies and peonies add the sweet playfulness. Bohemian and romantic, this floral arrangement is sure to capture guests eyes whether hanging over the dance floor or the alter. 3. Naturally Chic – Hanging a long boxed floral arrangement can be the perfect way to have the benefits of a centerpiece without taking up any valuable table real estate. It allows guests to see each other across the table without vases blocking their view, while also allowing you the space and freedom to go big with your flowers. This is the perfect solution to keeping the long elegant tables clean and chic, and still bringing color and beauty into the room. 4. Sweet – If long tables are not an option or round tables are preferred, suspended floral arrangements are still a great option. Spheres of flowers hanging above a round table can give all the height desired from normally using tall vases. This option also does not compromise any table real estate or guests views. It even allows extra room to place a simple low arrangement. Whether you choice baby’s breath, roses, or peonies, the result will still be beautiful and memorable for everyone.